If you build a website and map it to a custom address such as www.yourdomain.com, you can make it even easier for people to reach your site by typing simply yourdomain.com That web address without the www is called naked domain. These days in the cloud era hosting of Naked domains with providers like SashiDo, Heroku, OpenShift and others it is a bit tricky, but not impossible. Check out whether your DNS provider supports naked domains redirection. Buy a cheap VPS, install a webserver with redirection rule and add an A record to your DNS with the IP of the VPS. The only thing you should do is go to your DNS provider and add the gowww.io IP address (the current IP address is 144.217.225.221) as an A record to your naked domain. 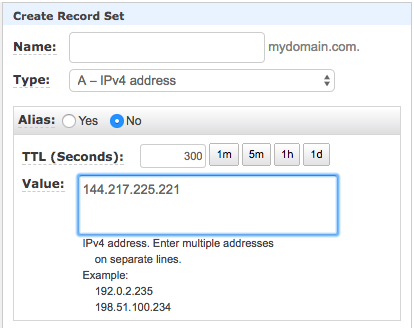 See how the operation will look like if your domain is mydomain.com and you are using AWS Route53 DNS Service. After filling in the IP address you just click on save and you are done. That's it! How to test whether it is working? The change you have made can take some time, because it depends on your TTL DNS settings. If you are using MacOS or Linux you can simply use nslookup or dig commands. Depending on your domain name if you see a line similar to this one, it means that you're in the game! Just in brief see what gowww will do for you. Yes, I know. This is boring stuff and yes, gowww saves us a lot of time.